The Airpura C600 features a large 3" activated carbon bed (26 lbs of carbon!) to remove hundreds of common gaseous chemical contaminants and VOCs. The extra-deep carbon filter enhances contaminant contact time to increase chemical adsorption by the carbon media. A HEPA-grade post filter removes airborne particulate. 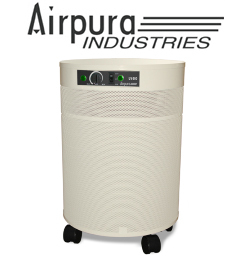 The Airpura C600 is equipped with a 560 cubic foot per minute variable-speed fan with a one-piece assembly to reduce vibration and noise, felt gaskets to prevent contaminant bypass (many competitors use rubber seals that off-gas VOCs), and an attractive powder-coated steel mesh housing with 360 degree intake. The Airpura 600 series has one of the highest air processing rates in the industry, however, noise level from the fan remains well below competitor's models with less air flow. Recommended Application: The Airpura C600 is an excellent choice for homeowners who are primarily concerned about gaseous contaminants, chemical (VOC) reduction, and odor suppression. Important Note About Radon Removal: The C600 is currently our top recommendation for homeowners seeking to remove radon from their air. Please note: While using an air purifier containing activated carbon filters is an important part of a residential radon abatement program, source control and ventilation should always be regarded as the primary approach to radon control. Where source control and ventilation are insufficient to achieve safe or targeted levels, or if an extra measure of protection is desired, air filtration with activated carbon is an effective complementary abatement approach. We do not advocate using an air purifier on its own for radon reduction without source control/ventilation. The effectiveness of an air purifier for radon removal will depend greatly on the air processing rate, room size, and re-contamination rate. Regardless of the radon reduction approach or approaches used, we are also strong advocates of regular follow-up testing to ensure that your radon reduction strategies are effective and continue to be effective as time passes. The following guide produced by the U.S. EPA offers some useful information on reducing the amount of radon entering your home: Consumer's Guide to Radon Reduction. Airpura T600 is backed by an impressive manufacturer's 5 year parts replacement, and 10 year labor repair warranty.